Card of the Day ~Positive Thoughts Create Positive Results~ This situation calls for uplifting thoughts, which are the magic ingredients you’ve been looking for. 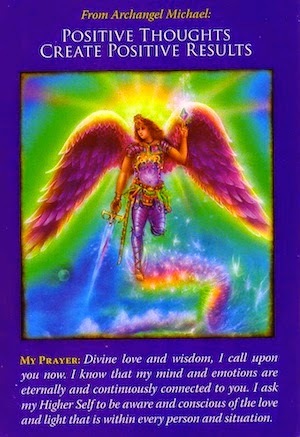 Although you may protest that you already have a positive mind-set, Archangel Michael advises you to purge your thoughts and speech of any worries or other negativity that could diminish your manifestations. Michael says that you can tell how constructive your thoughts are by paying attention to recent events in your life, as there is a direct correlation between positive thoughts and positive results. He’ll help buoy your spirits to a truly beneficial level so that your experiences are happy and welcome. I know it’s difficult to remain positive especially if you think your life is really sucky right now. I urge you to please pay attention to every word that comes out of your mouth because you may not realize you are sabotaging yourself. You deserve the very best in life and I want you to have that. ~Prayer: Divine love and wisdom, I call upon you now. I know that my mind and emotions are eternally and continuously connected to you. I ask my Higher Self to be aware and conscious of the love and light that is within every person and situation.~ I pray you all have a fantastic day. I love you all!